Monetary policy cannot be conducted looking through the rear-view mirror. Make no mistake, the GDP figures released on 25 January are disastrous. Growth fell by 0.5 per cent in the last quarter of 2010 and only the deluded or misguided would blame it all on the weather. As I warned again last week, the economic data continues to worsen in four crucial areas - construction, net trade, business investment and unemployment. The data has been there since last summer, but the consensus forecasts continued to be overoptimistic. The VAT increase has raised the chance of another quarter of negative growth at the start of 2011. Double dip now looks highly likely. After all, the precon­dition for a double dip is a quarter of negative growth and that's what we've just had. The last thing Britain needs in this environment is a rise in interest rates, but the inflation hawks are at it again, advocating that we should raise interest rates because the rate of inflation - as based on the consumer price index (CPI) - has jumped to 3.7 per cent. Leading the charge for interest rate rises are several Telegraph columnists, most notably Jeremy Warner and Liam Halligan. On 23 January, Warner claimed that "putting growth before inflation will be the ruin of us". He went on to argue that "concern for lives blighted by joblessness is a laudable sentiment, but the Bank's job is to control inflation, not to set social policy". Michael Fallon, the acerbic Tory party deputy chairman and member of the Treasury select committee (which monitors the Bank of England), recently called for a rise in interest rates, and even David Cameron has talked about the need to control inflation. In my view, this is one of the consequences of Mervyn King's ill-considered involvement in fiscal policy as governor of the Bank of England, which has made the job of the Monetary Policy Committee (MPC) harder by inviting all sorts of reciprocal commentary on the Bank's performance. If the governor is allowed to talk about fiscal policy, the door is open for politicians to try to influence monetary policy. Such interference risks preventing the MPC from doing its job properly. The danger in this case is that, in an attempt to ensure its credibility in fighting inflation, the MPC will respond to the pressure to increase interest rates and make a very bad decision. A recent FT editorial put the dilemma well. "Despite the shaming", it said, "the Bank should resist the hysteria" and "let the criticism wash over it and leave the interest rate where it is". I agree. The latest GDP figures confirm that growth was slowing sharply and unemployment rising even before the VAT increase and spending cuts began to take effect. And consumers are hurting. Markit's Household Finance Index slumped this month to its lowest level since April 2009. Roughly 34 per cent of households reported a deterioration in their finances, while just 6 per cent reported an improvement. The index measuring the outlook for household finances dropped to its lowest point since the survey began in February 2009, and the plunge from 35.7 in December to 26.7 in January was the largest monthly fall in the survey's history. Monetary policy cannot be conducted looking through the rear-view mirror. It has to be forward-looking because changes in interest rates take between 18 months and two years to take effect. What is gone is gone. 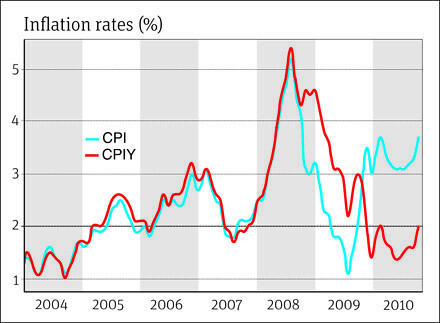 The chart below shows changes in CPI inflation. The MPC targets inflation by statute and, when it gets more than 1 per cent away from that target of 2 per cent, the committee has to write to the Chancellor explaining what it intends to do to fix matters. There have been quite a few letters of late, and there are more to come. The peak of 5.2 per cent in the chart came in September 2008, the month in which Lehman Brothers failed and the world stood on the brink of financial disaster. Even then, when it was absolutely clear that interest rates should have been cut, there were people calling for a rise. On 4 October 2008, Liam Halligan wrote in the Telegraph: "I still don't think the Bank's monetary policy committee should cut rates . . . Having already lowered them from 5.75 to 5 per cent since last autumn, the MPC is under intense pressure to ease. Yet inflation remains at 4.7 per cent - more than double the MPC's 2 per cent target. It could reach 5 per cent next month, or even more. At times like this, as we face a serious slowdown and inflationary expectations remain high, the credibility of our monetary regime is vital. Cutting rates when inflation could soon be approaching three times the target throws that credibility out the window." At an emergency meeting of the MPC four days later, on 8 October 2008, rates were cut by 50 basis points, then by 150 basis points in November, 100 basis points in December and 50 basis points in January, February and March 2009. Quantitative easing began in March 2009. Inflation plummeted to 1.1 per cent in Sep­tember 2009. Halligan and his fellow-travellers were wrong then and are wrong now. The chart also plots CPIY, which is CPI inflation excluding indirect taxes. This is on target at 2 per cent. It is clear that the CPI rate has jumped since the end of 2009 because of the increase in indirect taxes, which is not something to which the MPC should respond. The MPC's Adam Posen has confirmed in the past week that there is nothing in the recent data to make the committee waver from its view that there is still a lot of spare capacity in the UK economy and underlying inflationary pressure remains weak. The MPC forecasts that average inflation rates from the second quarter of 2012 to the fourth quarter of 2013 will be consistently below 2 per cent. This forecast is based on the committee's growth forecast, which is extremely optimistic; if growth is disappointing, inflation will be even lower. The chance that CPI inflation will be below 1 per cent is roughly 30 per cent, and the chance that it will be below 1.5 per cent is roughly 45 per cent, a considerably higher probability than it being between 1.5 and 2.5 per cent. One of the few things that George Osborne, Ed Balls and Danny Blanchflower would agree on right now is that this is no time to raise interest rates.